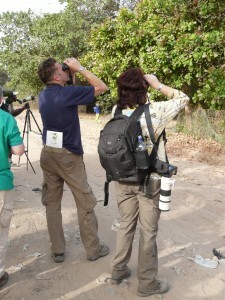 February 2012 – Just come bac k from the Gambia with Chris Packham on a birding trip. Saw 175 species in 4 days. Incredible variety and abundance. I would recommend the Gambia, as only >6 hours from UK and no jet lag. Stayed in a lovely hotel complex near to all the bird areas and beach. Gambia is a poor country and you have to deal with locals badgering you, but inside the hotel complex, life is serene. This place is a twitcher’s delight. PS: it is customary in the Birding fraternity to put one’s reference book down the back of your trousers – sadly there was no room in mine to try this little manoeuevre! This entry was posted in Next Trips.